November 6, 2018 - por Cindy Long. Last year on October 3 the Fresno Teachers Association held a strike vote. With one voice, the membership overwhelmingly supported the move with only 20 out of 3,000 voting against it. It would be their first strike since 1978. Nobody wanted a strike but FTA was willing to take it that far if for a contract that better served the 74,000 students of their district. Ultimately, a strike was avoided, and a year later, after an historic joint labor and management meeting between the district and the union. Fresno Unified has a new agreement with an 8.5 percent salary increase and a promise to reduce class sizes. 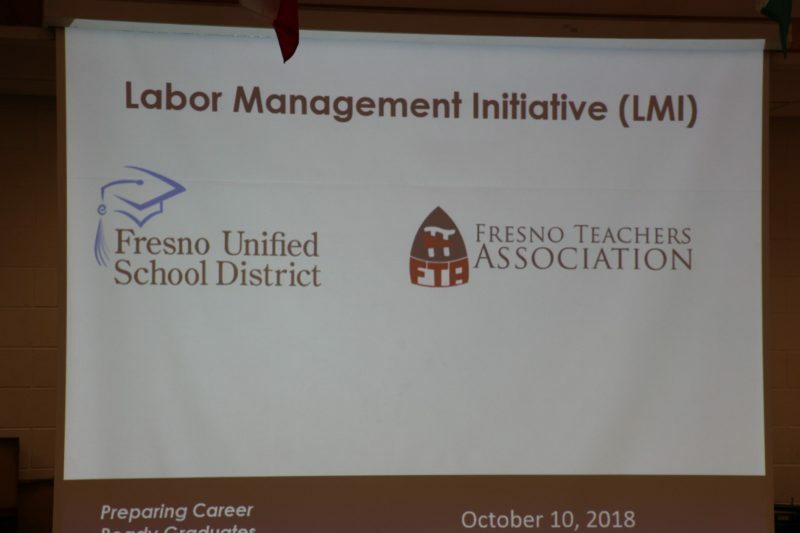 In a news conference with the FTA last month, Fresno Unified superintendent Bob Nelson said that the union and the district are turning “conflict and chaos” into “collaboration and cooperation” between labor groups, district leaders and community members. It was a journey, and Bonilla explains below how they got there and the lessons he learned along the way. Three members of district leadership and three members of union leadership met with a conflict resolution team at Fresno Pacific University, known for strong programs in teacher education and peacemaking and conflict resolution. Through that process, we agreed we had the same goals. We want to serve our 74,000 students and our community, which has one of the highest concentrations of poverty in America. And we agreed that finding solutions together would have a better impact. So that became our foundation going forward – we have the same goals, let’s have the same solutions. We decided we’d be an example of how systems can come together to effect change. To allow everyone to participate and share their voice, we had to expand the circle. We started with three on each side, but then district invited the union to the principals’ institute and cabinet meetings. We invited the superintendent and his staff to our Representative Council. But there were more voices to be heard. We invited all school site representatives to bargaining meetings. That way we could see that issues that come up to the leadership level are probably system-wide, not just site based. When I was teaching over the past decade, we weren’t involved in the decision making process on how to achieve the goals of best serving students. Now we – the educators, the union — are more involved than ever. Besides the parents, teachers spend the most time with students. We know better than most what these students need in the classroom. We must be at the table to share our expertise and collaborate. When teachers realized they were being heard, more came forward to share their ideas. We still have tough conversations and we still will disagree, but how we go about that, different way. Our leaders have emerged and showed us different ways. Fresno Teachers Association President Manuel Bonilla (left) and Fresno Unified Superintendent Bob Nelson. We set up meetings to talk to the parents, teachers, students and community at all seven high schools and each of the middle and elementary schools. We have 106 schools in our district and we wanted each of them to be involved in the process. We asked them what their issues were. What did they want to see? Lower class sizes came up time and time again, and we turned that into bargaining language for the contract. They wanted more social and emotional supports, and that was put into the language, too. Now the contract was seen in the right light – as a direct means to improve education, not just as a business transaction. You can’t just listen. You must take action, and that won over the community. But it also got teachers more excited. Teachers hadn’t been involved with the union in the past because they didn’t see its role in the day-to-day work of the profession. Now they were seeing how the contract was interwoven into education. Now they were getting involved and we made sure all of their voices were heard. We wanted to allow our members to hear everything about the process. We had a core bargaining team that worked during school hours, but we also had an evening team so teachers could listen to what was going on. At the first meeting, maybe 150 educators showed up. By the next, it grew to 400, and to 900 the next time. It just grew and grew. Everyone was invested in the process. Everyone felt like they had a voice. We shared bargaining updates on social media to communicate with members, but also with the community. We were very, very open. We wanted them to know we have nothing to hide. We were breaking the narrative that collective bargaining is about is about partisan issues and showing them it’s about improving education. No matter the field, professionals will be motivated and empowered if they understand the goals of the organization where they work. Beyond wanting to be treated as professionals, we heard from our educators that they need to understand the district’s vision. They want clear expectations and a full picture of where we’re going. They want more communication and they want to feel that their time and expertise is valued and taken into account. If you listen, you can hear a slight sigh of relief, the sound of the ice beginning to crack. I don’t think every single educator feels as if their voice is being heard, but we planted a seed of hope. Are we having great conversations at the district level and leadership level? Yes, but until it filters down all the way to the classroom, we are not done. This meeting was first step. We’ve begun the journey. Everyone feels like this is new and different. It feels different. It feels better. The question, what will show that it’s different? What will the evidence be. Hopefully we’ll see that through the actions we take over the course of this contract. This process didn’t start two weeks ago. It’s not lost on me that we had to take a strike vote first. Had we not done that, had we not been unified and engaged with our members, we wouldn’t be here. The district leadership need to know that the teachers are speaking with a unified voice. Until you do that, they have no real motivation to bargain seriously. The only reason I was able to be in that room to have those tough conversations was because I knew we had the power of the membership behind me. Going forward, we must keep the members engaged to keep the union strong. That’s how we serve our students and schools.